When unemployed San Francisco reporter Chuck Townsend, 45, and his college dropout son, Justin, take a trip to Mexico in 2016, each hopes to rebuild a relationship after years of estrangement. But their journey takes an unexpected turn when they meet a cruise-ship lecturer who has discovered the secret of time travel. Within days, Chuck and Justin find themselves in 1900, riding a train to Texas, intent on preventing a distant uncle from being hanged for a crime he did not commit. Their quick trip to Galveston, however, becomes long and complicated when they wrangle with business rivals and fall for two beautiful librarians on the eve of a hurricane that will destroy the city. Filled with humor, history, romance, and heartbreak, September Sky follows two directionless souls on the adventure of a lifetime as they try to make their peace with the past, find new purposes, and grapple with the knowledge of things to come. 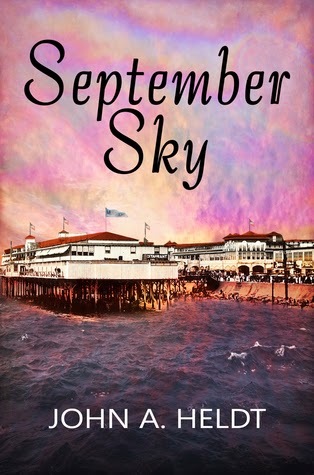 Having read 3 of the 5 books in Heldt's Northwest Passage that also focus around time travel I was looking forward to reading September Sky which is the first book in his new American Journey series. I ended up a little conflicted in my opinion of this one. It's a great story but I felt absolutely no attachments to the characters which was a bit of a disappointment. Chuck and his son Justin had no respect for the professor and the rules they agreed to. They immediately went off the reservation and followed about on their own agenda. Right from that moment I found myself a little disconnected and didn't feel invested in much of the story after that. I did however like the historical part of the story. I learned a lot about a real tragedy which prompted me to look up information on the actual event. Heldt captured the true horror of it and I was engrossed in that part of the story. This definitely made up for the detachment I had from the characters and I was left wondering about the next installment and who is going to travel next. Based on the author's other books I'm pretty sure I'll be reading book 2 in the series. I recommend this for anyone who loves time travel romances.